The Trabuco Hills Mustangs (5-2) opened South Coast League play on Tuesday when they hosted the El Toro Chargers. The Mustangs jumped out to an early 4-1 first quarter lead and never looked back. The Mustangs controlled time of possession with the help of FOGO John Day and saw numerous players make contributions on both ends of the field. Senior attackmen Garrett Redwine and midfielder Justin Paget both netted their first goals of the year. In all, the Mustangs had seven different players score goals and six different players tally at least one assist. Freshmen goalie Cooper Gatine returned from a broken thumb and saw his first action of the year in relief of starter Chris Demarco. El Toro goalie AJ Sherer made a number of excellent saves on Mustang players at close range. 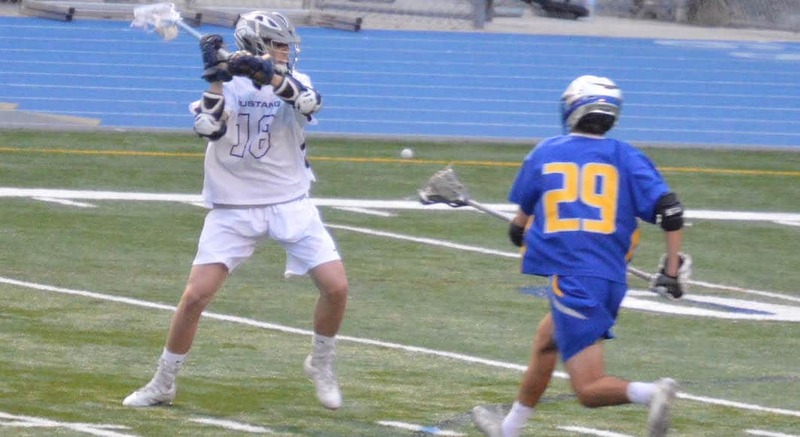 El Toro attackmen Nima Moniri scored two goals and Daniel Zertuche scored one for a final score of 16-3. The Mustangs travel to Aliso Niguel on Thursday and El Toro hosts Dana Hills on Friday. Next articleEL Modena, the Birthplace of Orange County Lacrosse?